The main reason to have a domestic water well is so that you can have a reliable water source. When constructing or drilling a well, the experts have to ensure that they design a well that is capable of yielding the required results. The pumping rate has to be compatible with the household needs in order for it to be effective. This means that knowing the intended use is the first step when it comes to well construction. Well yield is the rate that the well can be pumped all the while making sure that the water remains at the desired level and does not go below the pump intake. The well yield will depend on different factors notably the features of the aquifer, the well construction and the well maintenance. These factors are essential to ensure long-term yield sustainability. The features or characteristics of the aquifer vary from highly porous sands to clays that are low yielding and hard rock. Wells that are constructed in materials that are more porous will usually be high-yielding, while those completed in bedrock and clays that are less porous can slow down the groundwater flow. To get optimum results from the well, it is very important to ensure the right well construction techniques. The movement of water is an important factor when optimizing well yield. The screened part of the well allows water to get into the well while reducing or preventing transport of sand and silt. A screen that is improperly sized or one with slots that are too large or too small can allow sediment in the water to clog the well or grit to cause damage to the pump. If the submersible pump is too shallow it can draw down the water levels too fast. A pump is required to go on and off repeatedly when the water table falls and rises and this often damages the pump. If the elevations of the water table drop after the well construction, the result is a decline in well yield. There are several options for correcting low well yield. A well that is constructed in aquifers that are low-yielding can benefit from well deepening and lowering of the pump. If you have an open-borehole well, such as that constructed in bedrock, you can experience increased yield if the well is fractured or fracked. 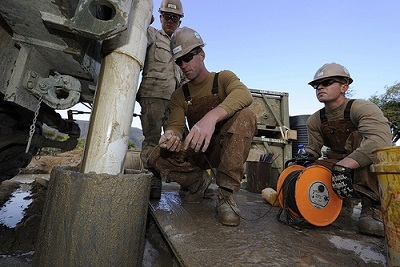 The process of hydro-fracking involves sealing some portions of the well in order to increase the pressure inside the borehole causing the rock to fracture. A large number and frequency of the fractures can increase yield. Well maintenance can help to improve the yield. Surging and scrubbing the well piping and the screen is an efficient way to increase well yield by removing scale formation. An experienced and licensed pump installer will use a pump rig to ensure effective scrubbing. Well surging and scrubbing will help to remove slime, scale and other particles in the well. When you decide to get a well on your property, make sure that you work with professionals who are experienced in well drilling.